A thermocouple is basically a temperature sensor and there are many thermocouples designs. Your kiln may or may not have its original thermocouple, particularly if it were purchased used or replacements were made with incorrect or non-Evenheat parts. 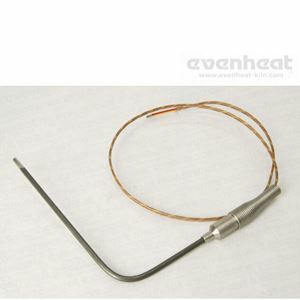 We recommend that you match your old thermocouple to the image shown before ordering. Electricians Installation Note: When installing your replacement thermocouple note that the thermocouple lead wires from the controller are colour coded: red and yellow. Your replacement thermocouple will be marked with a red dot. The red wire from the controller must connect to the side of the thermocouple with the red dot. Failure to follow this note may cause improper reading or operation.